This article is about the headquarters of Google. For the large number, see Googolplex. The original complex, with 2,000,000 square feet (190,000 m2) of office space, is the company's second largest square footage assemblage of Google buildings, after Google's 111 Eighth Avenue building in New York City, which the company bought in 2010. Once the 1,100,000-square-foot (100,000 m2) Bay View addition was completed in 2015, the Googleplex became the largest collection of Google buildings with 3,100,000 square feet (290,000 m2) of space. "Googleplex" is a portmanteau of Google and complex (meaning a complex of buildings) and a reference to googolplex, the name given to the large number 10(10100), or 10googol. The site was previously occupied by Silicon Graphics (SGI). The office space and corporate campus is located within a larger 26-acre (110,000 m2) site that contains Charleston Park, a 5-acre (20,000 m2) public park; improved access to Permanente Creek; and public roads that connect the corporate site to Shoreline Park and the Bay Trail. The project, launched in 1994 was built on the site of one of the few working farms in the area and was city owned at the time (identified as "Farmer's Field" in the planning documents). It was a creative collaboration between SGI, STUDIOS Architecture, SWA Group, and the Planning and Community Development Agency of the City of Mountain View. The objective was to develop in complementary fashion the privately owned corporate headquarters and adjoining public greenspace. Key design decisions placed parking for nearly 2000 cars underground, enabling SWA to integrate the two open spaces with water features, shallow pools, fountains, pathways, and plazas. The project was completed in 1997. The ASLA noted that the SGI project was a significant departure from typical corporate campuses, challenging conventional thinking about private and public space and awarded the project the ASLA Centennial Medallion in 1999. STUDIOS Architecture was the architect for the original SGI campus and provided both interior architecture and base building design. The former SGI facilities were leased by Google beginning in 2003. A redesign of the interiors was completed by Clive Wilkinson Architects in 2005. In June 2006, Google purchased some of Silicon Graphics' properties, including the Googleplex, for $319 million. Since the buildings are of relatively low height, the complex sprawls out over a large area of land. The interior of the headquarters is furnished with items like shade lamps and giant rubber balls. The lobby contains a piano and a projection of current live Google search queries. Facilities include free laundry rooms (Buildings 40, 42 & CL3), two small swimming pools, multiple sand volleyball courts, and eighteen cafeterias with diverse menus. Google has also installed replicas of SpaceShipOne and a dinosaur skeleton. Since 2007 the site has featured a series of solar panels covering the rooftops of eight buildings and two solar carports, and capable of producing 1.6 megawatts of electricity. At the time of installation, Google believed it to be the largest in the United States among corporations. The panels provide the power needed for 30% of the peak electricity demand in their solar-powered buildings. Four 100kW Bloom Energy Servers were shipped to Google in July 2008, making Google the first customer of Bloom Energy. The Android lawn statues (previously outside of Building 44 on Charleston Road), are now located on the Google campus at 1981 Landings Drive (at 37°25′06″N 122°05′17″W﻿ / ﻿37.4184135°N 122.0879531°W﻿ / 37.4184135; -122.0879531), and include a giant green statue of the Android logo and additional statues to represent all the versions of the Android operating system. In 2013 construction began on a new 1.1 million square foot headquarters campus dubbed "Bay View" adjoining the original campus on 42 acres leased from the NASA Ames Research Center and overlooking San Francisco Bay at Moffett Federal Airfield. The estimated cost of the project was $120 million with a target opening date of 2015. NBBJ is the architect and this is the first time Google has designed its own buildings rather than moving into buildings occupied by previous businesses. The addition is off the northeast corner of the complex, by the Stevens Creek Nature Study Area/Shoreline Park. Before announcing the construction, Google, through its in-house real estate firm, Planetary Ventures, sought permission from the city of Mountain View to build bridges over the adjacent Stevens Creek. Google's 2012 year-end annual report noted it can develop only 7 acres of the 42-acre site. Google plans a 60-acre addition designed by Bjarke Ingels in North Bayshore. A Google shuttle bus at the Sunnyvale campus. 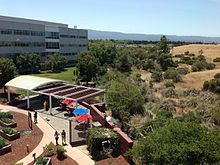 The Googleplex is located between Charleston Road, Amphitheatre Parkway, and Shoreline Boulevard in north Mountain View, California close to the Shoreline Park wetlands. Employees living in San Francisco, the East Bay, or South Bay may take a free Wi-Fi-enabled Google shuttle to and from work. 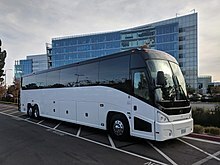 The shuttles are powered by a fuel blend of 95% petroleum diesel and 5% biodiesel and have the latest emissions reduction technology. To the north lies the Shoreline Amphitheatre and Intuit, and to the south lies Microsoft Corporation's Silicon Valley research complex, the Computer History Museum, and Century Theatres. Moffett Field lies nearby to the east. Google in its 2012-year-end annual report said it had 3.5 million square feet of office space in Mountain View. Google has another large campus in Mountain View dubbed "The Quad" at 399 N Whisman Road about 3 miles from the Googleplex. In 2013, Google leased the entire Mayfield Mall, an enclosed shopping mall that last operated in 1984 and was leased by Hewlett-Packard from 1986 to 2002. In addition, the secret Google X Lab, which is the development lab for items such as Google Glass, is located in "ordinary two-story red-brick buildings" about a half mile from the Googleplex. It has a "burbling fountain out front and rows of company-issued bikes, which employees use to shuttle to the main campus." The Googleplex was featured in the 2013 film The Internship, with the Georgia Tech campus standing in as a double. It was also the inspiration for the fictional Hooli headquarters in the HBO TV series Silicon Valley. ^ Strickland, Jonathan (2008-08-04). "HowStuffWorks "Introduction to How the Googleplex Works"". Howstuffworks.com. Retrieved 2013-05-24. ^ Mountain View, CA - Nicholas Perry - Google Books. Books.google.com. 2006. ISBN 9780738531366. Retrieved 2013-06-15. ^ "Medallion Sites" (PDF). American Society of Landscape Architects. Retrieved 2015-03-01. ^ Olsen, Stefanie (2003-07-13). "Google's movin' on up with Sujeet Kumar and Manohar Patti". CNET News.com. CNET Networks, Inc. Retrieved 2007-01-04. ^ Mills, Elinor (2006-01-19). "Google buying its Mountain View, Calif., property". CNET News.com. CNET Networks, Inc. Retrieved 2007-01-04. ^ Conrad, Katherine (June 14, 2006). "Google to purchase Mountain View buildings". San Jose Mercury News. AccessMyLibrary. Retrieved 2009-11-07. ^ Weinberg, Nathan (2007-11-08). "Yes, Google Has The Dinosaur". google.blognewschannel.com. Retrieved 2013-01-23. ^ Mohney, Chris (2007-02-06). "25 things to see at the Googleplex before you die". Valleywag. Gawker Media. Archived from the original on 2009-09-25. Retrieved 2009-08-08. ^ "Reducing our Footprint". Google. Retrieved 2010-09-30. In Mountain View, CA, for example, we currently have a 1.6-megawatt solar power system that generates 30% of the peak power necessary to fuel the buildings on which they are located. ^ "Google announce lease at Ames Research Center" (PDF). www.nasa.gov. NASA. June 2008. Retrieved 2015-12-28. ^ Letzing, John (2013-02-22). "Google Starting Construction on New Campus - WSJ.com". Online.wsj.com. Retrieved 2013-05-24. ^ Goldberger, Paul. "Exclusive Preview: Google's New Built-from-Scratch Googleplex". Vanity Fair. Retrieved 2013-05-24. ^ "Googleplex: Google to build $120m futuristic HQ with a garden on the roof | Mail Online". London: Dailymail.co.uk. 2013-02-25. Retrieved 2013-05-24. ^ Russell, James S. (2013-04-24). "Google's New Campus Has Light, Fresh Air, Low Power Use". Bloomberg. Retrieved 2013-05-24. ^ a b "Form 10-K". Sec.gov. Retrieved 2013-05-26. ^ Stone, Brad (2015-05-07). "Big and Weird: The Architectural Genius of Bjarke Ingels and Thomas Heatherwick". Bloomberg. ^ Spivack, Cari (2004-09-13). "Worth the drive". Official Google Blog. Google, Inc. Retrieved 2007-01-04. ^ "Campus operations -- A closer look". Google, Inc. Retrieved 2012-06-15. ^ Jolie O'Dell2011-05-17 20:17:36 UTC (2011-05-17). "Google To Open New Campus in Mountain View [PICS]". Mashable.com. Retrieved 2013-05-26. ^ "Google to Rent Former Mall in Largest Silicon Valley Deal". Bloomberg. 2013-09-11. Retrieved 2015-10-01. ^ Kelly, Caitlin (2012-04-28). "Google Course Asks Employees to Take a Deep Breath". The New York Times. ^ Stone, Brad (2013-05-22). "Inside Google's Secret Lab". Businessweek. Retrieved 2013-05-26. ^ Jessica Guynn and Dawn C. Chmielewski (2013-05-25). "The Internship, now starring ... Google". Los Angeles Times. Retrieved 2015-04-05. ^ Donato-Weinstein, Nathan (2014-04-17). "How HBO captured the look of 'Silicon Valley' tech office spaces". Silicon Valley Business Journal. Retrieved 2015-04-05. 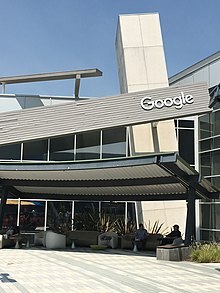 Wikimedia Commons has media related to Googleplex. Andrew Norman Wilson's Viral Video "Workers Leaving the Googleplex"
This page was last edited on 23 April 2019, at 13:31 (UTC).